If you're looking to let a property in SE1 and the surrounding areas of Central London you've come to the right place. Garrett Whitelock is a dynamic local independent agency with a passion for delivering great service and with a local, national and international reach. We know the local market inside out and our extensive marketing activities ensure that we can let your property for the best price possible. Having rented my property in SE1 for many years with another estate agent, I decided to use Garrett Whitelock after one of their flyers came through my door. I can't speak highly enough about them. Their service is far superior to what I was getting, and they respond to any questions almost instantly. I genuinely feel in safe hands, and I can't recommend them highly enough. How can I be sure you can find me a tenant? At Garrett Whitelock we advertise properties to let on all the major portals, including Rightmove, Zoopla, Primelocation and many others, as well as on our own website, generating a steady stream of applicants looking for properties. We also have close links with corporate relocation companies and our office on Tower Bridge Road benefits from high levels of passing trade. As a company, we keep a list of active tenants looking for properties and contact them immediately as soon as a property meeting their brief comes onto the market. We are extremely proactive and work closely with landlords to ensure rents are maximised and void periods are kept to a minimum. At Garrett Whitelock one of our lettings agents will always accompany viewings so we are on hand to answer any questions prospective tenants may have about your property, the area or renting in general. Viewings are arranged at a time to suit you or any existing tenants living at the property. How do you ensure that prospective tenants are creditworthy? We use a highly reputable independent referencing company to carry out detailed checks on all prospective tenants. These include employment checks, landlord checks and credit checks. What costs and fees are involved in letting my property? It is now a legal requirement for every rental property to have an EPC, which you must make available to prospective tenants no later than 28 days after marketing commences. Garrett Whitelock can arrange for an EPC to be carried out on your behalf at a cost of £65 including VAT if required. Once you have paid for an EPC it is valid for 10 years and can be used for multiple tenancies during that period. It's a legal requirement for rental properties with mains gas to have an annual Gas Safety Certificate. Garrett Whitelock can arrange this for you at a cost of £78 including VAT if required. Garrett Whitelock uses the services of a competitively priced independent inventory clerk to prepare a detailed inventory of your property and to check your tenants in (the price of this service varies depending on your property's size). This fee is payable by you, whilst your tenants are liable for the inventory check-out fee of £80 including VAT at the end of the contract. Garrett Whitelock can arrange a full electrical report for your property if required. Prices vary depending on the size of your property. Please contact us for further details. Garrett Whitelock can also arrange a PAT test for all the electrical appliances in your property if required. Again, prices vary depending on your property's size. Please contact us for a full explanation of each of the above services. When can I expect to receive my rent? For landlords using our 'let only' service, you should receive your rent by standing order directly from the tenant on the rental due date each month (this is usually the date when the tenant moved in). For landlords using our rent collection service, the rent will be processed by us and paid to you the same working day it is received. How much deposit does a tenant pay, and what happens to it? At Garrett Whitelock we normally ask tenants to pay a 6-week deposit in addition to one month's rent in advance at the start of a standard tenancy. We then register the deposit with the Tenancy Deposit Service within 14 days, for the protection of both parties. When you appoint Garrett Whitelock to let your property, we guarantee that it will receive maximum exposure. Eye-catching letting boards, well-designed property details (professional photography and floor plans are included as part of our service) and a large shop front in a prominent location on Tower Bridge Road will get your property noticed for all the right reasons. To ensure your property is seen by a local, national and international audience, it will be listed on all the major property portals, including Rightmove, Primelocation, Zoopla and many others, where we regularly pay for premium listings to boost the profile of the properties we represent. Your property will also feature on the Garrett Whitelock website, and the many corporate relocation companies we work with will be notified of its availability. 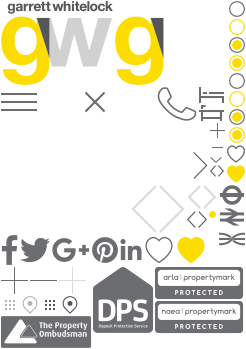 Advertising in local publications, PR and active social media campaigns complete the promotional package, ensuring your property receives maximum exposure and high levels of enquiries from prospective tenants. As part of our letting service, we take care of the tenancy agreements and register the deposit, as well as offering help and advice to landlords to ensure their property complies with current legal regulations - it's all included in our fee. As soon as we have found suitable tenants interested in renting your property, we employ the services of a highly efficient independent referencing company to give them a 360 - check. Once your tenants are accepted, they then sign the tenancy agreement, transfer the deposit and start paying you rent. We set up Garrett Whitelock to do things properly, after becoming frustrated with the general lack of accountability, integrity and professionalism in the industry. As owner-managers, we really care about our business, and providing a good service to our clients is at the centre of everything we do. When you appoint Garrett Whitelock we guarantee we will do everything possible to help you achieve a successful let - and when it comes to property management, we promise to take active care of your most important assets. Put simply, we want you to be so happy with our service that you'll tell all your friends about us! We specialise in residential sales, lettings and property management in SE1 and the surrounding areas. We are known and trusted in our patch, and completely understand the nuances of the many sub-areas within it. Because we're extremely active in the area, when you appoint Garrett Whitelock you can be sure of accurate valuations and up-to-date market knowledge. In fact, your next tenant is probably already registered with us. Garrett Whitelock is a fully accredited member of the National Association of Estate Agents (NAEA), the Association of Residential Letting Agents (ARLA), the Property Ombudsman and the Deposit Protection Service and abides by their strict codes of conduct, guaranteeing a professional service every step of the way. As a company, we also have Client Money Protection in place to safeguard your money from theft or misappropriation. We're a genuinely friendly bunch and enjoy what we do. It's our aim to find you a suitable tenant who is prepared to pay the optimum rental price for your property within your desired timeframe - we also want them to have a positive experience too. Our innovative online platform, My Property File, gives all parties the opportunity to see how things are progressing at any time. Letting a property can be stressful for both parties and the ability to check the exact status of your rental in real time helps to nip any potential problems in the bud and achieve a successful let. Garrett Whitelock will actively promote your property, conduct all viewings, negotiate the rent on your behalf, prepare the tenancy agreement, oversee the tenant check-in and register the deposit. Our fee for this service is 8% + VAT-Inclusive, which is payable as a single sum at the start of the tenancy. This service includes everything in our 'let only' service, plus we collect the rent on your behalf and chase any unpaid sums. Our fee for this service is 9% + VAT-Inclusive, which is deducted from the rent on a monthly basis to aid your cash flow. As a company, we also have Client Money Protection in place to safeguard your money from theft or misappropriation. This is our most popular service and includes everything in our 'let only' and 'rent collection' services, with the added reassurance of full management. As part of this service we conduct regular checks on your property and ensure that any maintenance issues are dealt with promptly to protect the value of your asset. Tenants frequently request managed properties when looking for a new home, safe in the knowledge that any repairs are carried out promptly, and an increasing number of astute landlords have switched on to the fact that a fully managed property helps to give them the edge when it comes to letting their property. Our fee for this service is 12% + VAT-Inclusive, which is deducted from the rent on a monthly basis to aid your cash flow. Find out more about our property management service. Most of our clients opt to let their properties via an assured shorthold tenancy agreement for a fixed term of six months or a year, with the option to renew thereafter. This provides landlords with a greater degree of certainty, as tenants tend to stay for longer periods, so there's less risk of regular voids occurring. The buy-to-let market has been affected by dramatic tax and legislative changes in recent years. Whether you're a seasoned buy-to-let investor, an 'accidental landlord', or looking to dip your toe into the water for the first time, Garrett Whitelock is here to assist you. Please call us on 020 3318 5532 for impartial advice tailored to your individual circumstances. How much can we achieve for you? Garrett Whitelock is extremely active in SE1 and the surrounding areas in Central London. Due to the fact that we let so many properties, our finger is really on the pulse when it comes to current market conditions and we can give you an accurate idea of your property's rental potential in today's market. If appropriate, we can also make suggestions to help make your property more appealing to prospective tenants to ensure you let it quickly and minimise the risk of future void periods occurring.